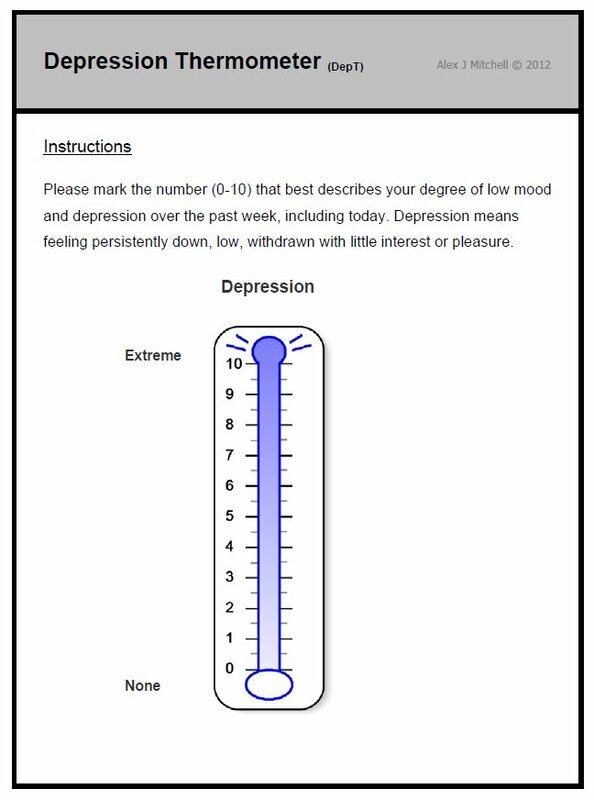 The Depression Thermometer (from the Emotion Thermometers) is a simple single item visual analogue screening tool for detection and monitoring of depression in clinical practice and research. It was created by Dr Alex Mitchell and is easy for most patients to understand, quick to administer and score. It is currently royalty free for (departmental) clinical use and for unfunded research (but please request permission via email to ajm80@le.ac.uk). In 1998 the Distress Thermometer (DT) was developed and validated for evaluation of distress (and anxiety and depression) in cancer [NCCN c/oRoth et al, 1998]. 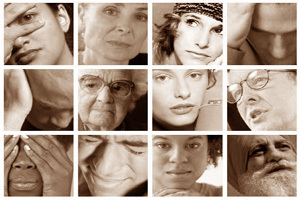 In 2007 we piloted and validated an extension of the DT called the Emotion Thermometers Tool. This is a new five dimensional tool retaining the convenience of the innovative DT but with superior accuracy. It comprises five visual analogue scales in the form of four predictor domains (distress, anxiety, depression, anger) and one outcome domain (need for help). Mitchell AJ, Baker-Glenn EA, Symonds P.
Mitchell AJ, Baker-Glenn EA, Park B, Granger L, Symonds P.
In our study in the Leicester Cancer Centre, 11.5% of people scored three or below on all ET domains and 69.3% scored four or above on at least one domain. Against the HADS depression scale, the optimal thermometer was the depression thermometer (sensitivity 60% specificity 78%). Finally, against the DSM-IV diagnosis of major depression the optimal thermometer was the depression thermometer sensitivity 80% specificity 79%) but no single method had good positive predictive value (PPV). Further improvements can be made by adjusting the cut-offs particularly for detection of anxiety (AnxT ROC = 0.867 at a cut-off of 5v6) and detection of depression (DepT ROC = 0.751 at a cut-off 4v5). We have published a series of posters on the ET at the IPOS and APOS conferences 2010-2012. Q. Has the DepT been validated? Q. Can the DepT be used clinically without permission? Q. Can the DepT be used for research without permission? A. No, please write to me with the title and duration of your proposed project. It is likely I will grant permission. Q. Is the DepT available with addition thermometer domains? Q. Is the DepT sensitive to change? Q. What is the best cut off on the DepT ? Q. Has the DepT been translated into.....my language? Q. Can the DepT be read out for those with visual (or other) impairment? Q. How easy is it to adopt the DepT into a screening programme delivered by cancer clinicians? Q. Can the DepT be computerised to automated screening?